Someone at Mercedes-Benz must have been feeling a bit nostalgic today, because they dropped a few totally rad handfuls of E500/500E photographs on the press site. Ostensibly the reason is the celebration of an anniversary. In March of 1994—25 years ago—Mercedes changed the name of the 500E to the E500, produced the 10,000th example, and then gave it to 5-time Le Mans winner and former Mercedes Formula One racer, Hans Herrmann (shown below). 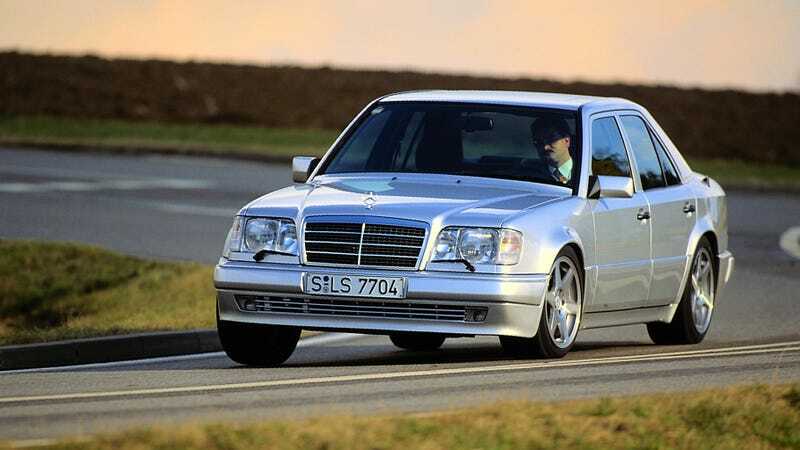 In case you don’t know, the 500E/E500 is the raddest German super sedan of the 1990s. Based on the W124 E-class sedan, Mercedes-Benz commissioned Porsche to shove the 5-liter V8 from the SL500 between its shock towers. Internally known by Porsche as the Type 2758, Porsche developed a new 1.5" wider widebody design for the Mercedes. Many of the car’s components needed to be upgraded in order to handle the new 322 horsepower and 354 lb-ft of torque powertrain. It was described as a Wolf im Schafspelz (wolf in sheep’s clothing) by the German press, and that’s not a bad way to put it. The restrained super sedan was capable of a 5.5-second 0-60 and could run up to nearly 160 miles per hour. Just look at how great this thing is. The peak of Mercedes 1990s design language mixed with a little bit of Porsche sports car flair. Couldn’t you see yourself, an important 1990s business person, driving this incredible exotic sedan on your way downtown to do business things? I know I would. Of course, if this wasn’t badass enough for you, AMG would happily build an E60 for you with the 375 horsepower 6-liter M119 V8. That would make me quite happy.